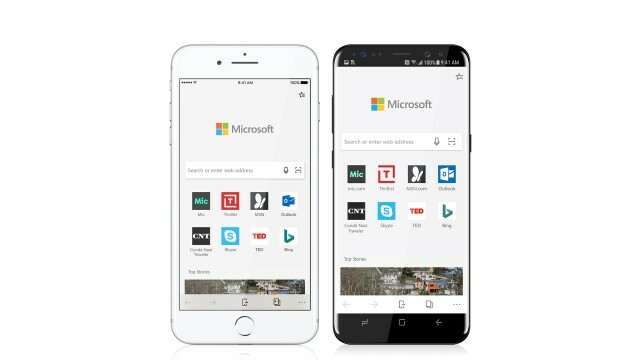 Microsoft today addresses one of the biggest shortcomings of its Edge browser, announcing its upcoming availability on the two biggest mobile platforms: Android and iOS. Microsoft says that support for Android and iOS is "one of the most common requests" that it has received from Edge users on Windows 10. By making it available across multiple platforms, the software giant is making its browser a viable option in this space for folks who use a mix of devices. Edge is also available on Windows 10 Mobile, but the vast majority of mobile users are on Android and iOS. What's more, its biggest rivals are already available on multiple platforms. Take Chrome for example, which is offered on Android, iOS, Windows, macOS and Linux. "Microsoft Edge for iOS and Android brings familiar features like your Favorites, Reading List, New Tab Page and Reading View across your PC and phone, so, no matter the device, your browsing goes with you," says Microsoft. "But what makes Microsoft Edge really stand out is the ability to continue on your PC, which enables you to immediately open the page you’re looking at right on your PC -- or save it to work on later." Microsoft will make Edge available initially as a preview, with iOS users being the first to get it -- starting today. The browser will be distributed using Apple's TestFlight service. There is no word yet on when it will also be offered on Android, but Microsoft does say that the app will be available "soon." The preview is limited to US-English, but support for other countries and languages will be added down the road. Also, Microsoft says that there are some features that will not be available from the get-go, like roaming passwords and support for tablets, but those too will be made available "in the future." If you want to be among the first to test Microsoft Edge on Android or iOS, click on this link to go to the preview program's landing page.